StarCraft: Remastered had been released to the public earlier today and it costs $14.99 on Battle.net. As a reminder, the legacy StarCraft: Brood War had become free for everybody since patch 1.18 came out in April this year. So if you don’t feel like buying SC:R, you can still play the original SC — which by the way, are multiplayer compatible with each other! An app for Android, called Winulator by Dan Aloni software, is being developed that lets users run Windows EXE/DLL files on ARM devices. So far, this app supports one game: Caesar III. 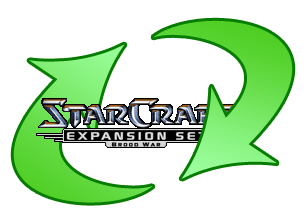 StarCraft: Brood War patch v1.16.1 is currently in working progress and will be the next game to be supported. You can watch a short preview of the developer testing StarCraft on a tablet with full touch controls in the video below. Winulator beta is available free in the Google Play Store, but note that StarCraft isn’t compatible yet. To support the developer, you can buy the paid version of Winulator. So how many of you still play StarCraft on Windows 7 with the colors all messed up? To be honest, this doesn’t really matter, because once you start a match, all the colors will be fine. The colors are only weird before, and after a match. Click File > Save As, and name the file as ColorFix.cmd. Now you can go enjoy your StarCraft with normal colors! Some commands in StarCraft have been discovered by deathknight recently. Probably the most interesting ones would be these commands below that you can enter while you are watching a replay. /replay show kills                      Shows the number of kills. /replay show razings                    Shows the number of razings. /replay show slaughter                  Shows the slaughter leaderboard. /replay show resources                  Shows the resources. /replay show minerals                   Shows the minerals. /replay show gas                        Shows the gas. /replay show score                      Shows the total score. 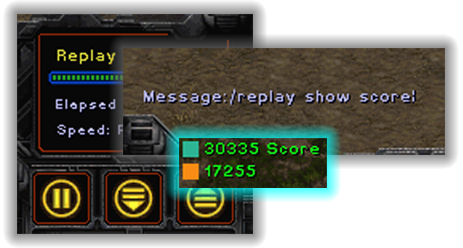 /replay show score units                Shows the units score. /replay show score buildings            Shows the buildings score. /replay show score kills                Shows the kills score. /replay show score razings              Shows the razings score. /replay show score user                 Shows the custom score. /replay hide                            Hides the leaderboard. Sometimes when you create a game on StarCraft, a few people will join… but you want to wait a little bit longer for more people to play. After a while, you realize that nobody else is joining your game, so what do you do? You probably say remake, or rm, and you cancel the game that you just made so that you can create the same thing again. However, you don’t have to do that! One way to get more people to join your game if you want a full house is to just close all the open slots, and then reopen the slots again. This is called refreshing your game. Another way to refresh your game, is to just tell someone in your game to leave and come back. You can tell him/her to rejoin or rj. This method of refreshing is faster and better if there are a lot of empty slots and you don’t feel like opening/closing them all. You know the game list on Battle.net is always updating. It’s showing the newest games that were just created, which will keep on pushing your game to the back of the list. By refreshing your game, it will help bring your game up to the front of the list so more people will see it again, thus you’ll get more people to join. These 2 methods of refreshing work on Battle.net, and also in Local Area Network mode. Next time you are waiting for more people to join your StarCraft game, try refreshing it! What may look like complex topics are just ways we want you to think more deeply about the game to derive a greater satisfaction from playing. Furthermore, this understanding should have applications in real life, to further synthesize new information from limited inferences. The primary goal is for students to learn, enjoy the art of competitive StarCraft, and have fun. Overall, students will be applying critical thinking, quick decision-making, and game theory skills throughout the sessions. Students will also learn what to look for in a replay or game to learn most effectively. Students should be familiar with all units and some basic StarCraft strategy. All students should of course enter the class with an open and analytic mind. All absences must be excused (you should inform the course facilitators no later than the Friday before) and more than two absences will result in a grade of “No Pass.” Please note that you will not be able to make up any work you missed during class and that new material will build on previous weeks’ instruction. Furthermore, there will be several pop quizzes graded based on completion given in class at a random time, and these will contribute to your participation score as well. It is also expected that students participate by asking questions and voicing their analytical suggestions during the instruction, and by practicing with others. Each week, students must submit 2 replays of games they played and are willing to analyze in depth. Students are expected to explain the flow of the game, identify the time of several positive and negative moves, and show an understanding of how to overcome mistakes in these replays. Some replays will be reviewed by the class together. These replays must be emailed to StarcraftDecal@gmail.com with this subject title: First Name, Last Name, Week #. Submissions without that subject title will not be guaranteed to be filtered into the correct folder, and hence, we cannot guarantee that it will be graded. Grading for these replays will be on a credit/nocredit basis. In addition to submitting replays, there will periodically be homework assigned online due in class the following week. There will be a final project where students will present and explain their contribution to the Starcraft Community. This may take the form of an essay detailing new theory or calculations, or an in-depth analysis of a significant game. Whichever final project is chosen will be displayed or published on a public forum for peer criticism. Read more about this from StarCraftWire.net! Just a video of a few Protoss taking on 400 zerglings and 200 hydras! Unfortunatly the Protoss did not win though. Yes, the Protoss are fully upgraded and the Zerg aren’t. More folders can be created in that location for organization and neatness. If you don’t care about organizing your maps, then just put them in the download folder. That’s where the downloaded maps go when you play on Battle.net. If you are behind a router/gateway with another computer and you tried playing StarCraft together with other people on Battle.net, you might have noticed that it was really laggy and unplayable. To fix this problem, all you have to do is change the ports for one of the computers on your network. The default port for Battle.net is 6112 and it lags because it can’t handle more than one computer in that port. So all you have to do is go to your router/gateway’s Port Forward page and set one of your computers to use a port between 6113 and 6119 (UDP, not TCP). After you forward a port for one of your computers, you need to open the Registry Editor for that computer. To do this, click Start, Run, and press enter after you type regedit. In the left side of the registry editor, navigate to HKEY_CURRENT_USER\Software\Battle.net\Configuration. Now click Edit > New DWORD Value, and name it Game Data Port. Double click that value that you’ve just created, click Decimal in the Base area, and type the port that you forwarded for your computer in ‘Value data’ (6114 for example), and press OK. Your computers sharing the same router/gateway should now be able to play on Battle.net with other people with no lag!